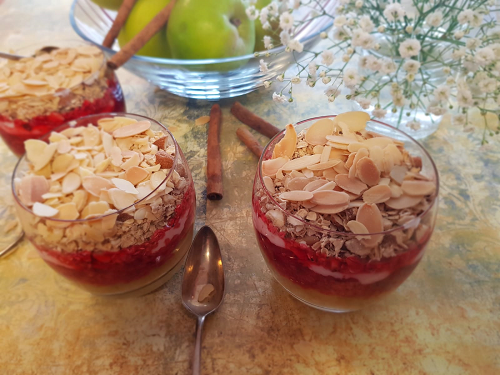 This recipe serves 3, an easy healthier pudding/dessert incorporating fresh apples and raspberries. This recipe is lower in fat, higher in fibre and is a good way to get your 5ADAY. This crumble can also be eaten for breakfast and quick and simple to make. In a pan add the apples, cinnamon and ½-1 cup of water, cook on medium heat and stew apples until soft. Add honey, gently mix and set aside. For the compote in a pan add fresh raspberries and cook on a medium heat for about 5-10 minutes until thick consistency. Do not overcook raspberries. For the crumble topping using a frying pan lightly toast the oats and chopped almonds on a low heat until slightly browned.